The Google Sitemap is based on default Magento Google Sitemap feature. You still need to generate your sitemap using CRON tab or generate it manually in Catalog -> Google Sitemap. Select the content type you wish to list in your site maps, edit it and go to the Google Sitemap tab. You can set the priority and frequency for each content types. Only contents that are enabled will show in the sitemap.xml file. If you like to generate sitemap from a menu hierarchy instead of the content type itself, you can define it in the menu edit form. 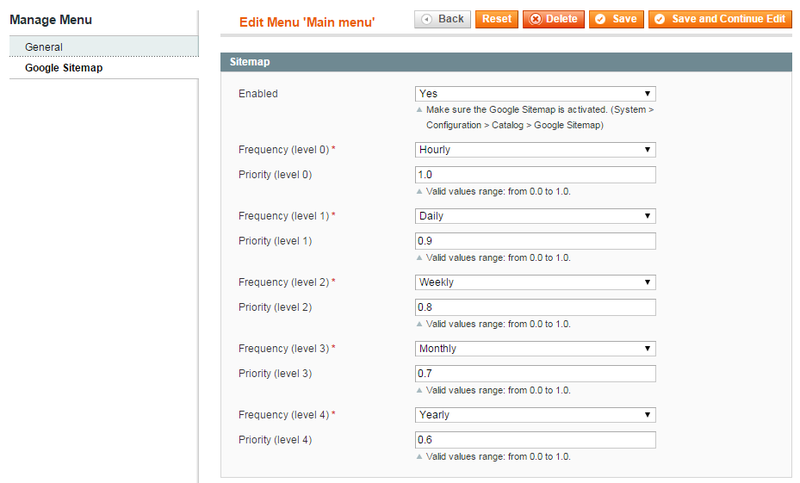 By this way you can define new priority and frequency for each level of your menu.